Claims of hearing loss can sometimes result in larger monetary settlements from insurance companies or in the proceedings of litigation. The audiology community has an immense repertoire of procedures available to it to detect such behavior. In some cases, the testing procedures are "better than a lie detector test". In addition to malingering of hearing loss, individuals may complain of ear pain, hyperacusis and tinnitus. All subjective symptoms of course. Our advice to those who are considering exaggerating hearing loss -- don't do it. When you are caught, it reduces your credibility, and you might lose your lawsuit. Hearing professionals are generally very good at detecting malingering. As hearing loss and tinnitus are subjective conditions, when there is a potential to gain by convincing another group of people that one has these disorders, it is common to encounter individuals claiming to have lost hearing or to have tinnitus. For hearing loss, this is a foolish undertaking, as there are abundant methods of showing that someone actually hears better than they admit. We will not go through the methods here, for fear of "giving them away", but suffice it to say that in hearing testing, there are a large number of ways to compare subjective to objective measures, as well as a few straightforward tests that are simply put - -lie detectors. As is the case for malingering in general, inconsistency between subjective claims and objective measurements is often the key clue. There are many simple methods of detection of an inconsistency between subjective claims of hearing loss (e.g. audiometry), and objective measurements of inner ear function. Recently, the advent of OAE tests have made the situation very simple. Someone who claims to be deaf on audiometry, but has normal OAE tests, is likely to be pretending. Another method of hearing testing that does not require cooperation is the auditory steady state response (ASSR) Attias et al, 2014. This technique requires special software that is not generally available. There are many many other techniques (e.g. Hone et al, 2003). We purposefully limit the information on this page, but it isn't difficult to detect malingering. OAE testing, especially the more precise method such as we use in our practice, can also clearly document that the patient is not malingering. An example of this is shown below. A patient was involved in an automobile accident and developed tinnitus after the collision. Her tinnitus was "matched" in the right ear to 7100 hz. 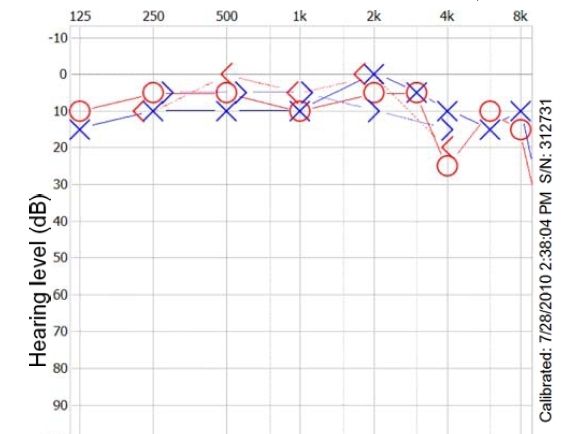 A regular audiogram was not very revealing -- often people forget that audiograms basically just test every octave -- if the ear is damaged somewhere other than the tone being tested in that octave -- the audiogram can be normal. However, a more careful audiogram that covered the frequencies around the tinnitus was abnormal. Audiograms are subjective tests, and in theory at least, someone could pretend not to hear at this frequency. However, an objective test is available -- the sweep OAE. 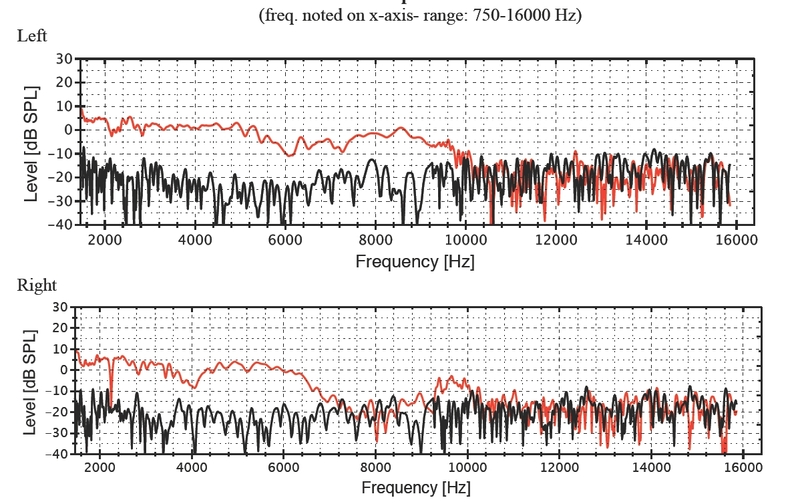 The sweep OAE shows poor inner ear function between 6500 and 9000 Hz, which is the same region that this person has hearing loss and tinnitus. 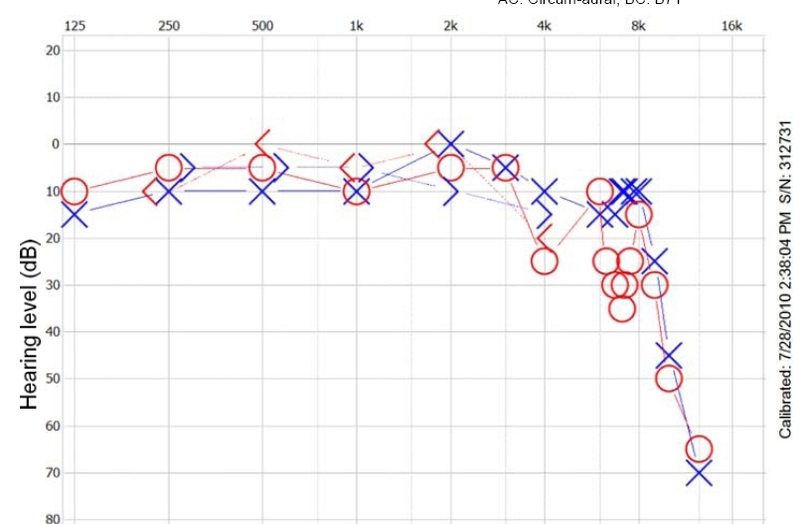 From the combination of the tinnitus match, detailed and careful audiogram, and sweep OAE, it is clear that this patient has objectively confirmed inner ear damage.